Physically, I am thriving. The wheeze in my chest is only occasionally noticeable and I rarely cough. More comfortable at night, I now sleep soundly and wake feeling rested. I feel hungry all the time, and have gained at least six pounds. In fact, aside from some daytime fatigue (an expected side effect of the Alimta), I feel really great. Not surprisingly, things have been looking up in the emotional department as well; I’ve got my mojo back. Obviously my improved physical state has come into play. However, there is more to it than that. Some months back, I came as close as I have ever come to losing hope: it seemed that my personal challenges were just too great. When I say this, I am not merely referring to my cancer, but rather insinuating a more general crisis of self. I shared my sense of despair with a few trusted individuals. I was clear eyed and practical about what I could and could not change. There were some difficult weeks where my focus was on merely getting by. However, during this time I was making some important decisions. One, I was going to start getting my affairs in order (more about this to come). Two, each additional day I got to spend with Peter, my youngest child, was a gift. And three, I was going to stop procrastinating creatively: I would draw, write, assemble and paint as if my life depended on it. And by doing so, maybe I could finally achieve some financial independence. The image above is of the painting I am now working on. 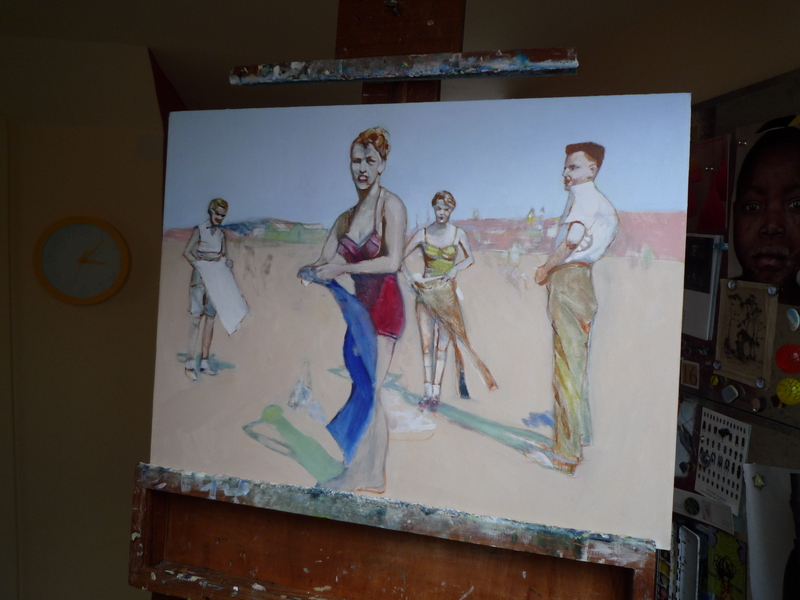 My reference is a black and white photo from the fifties of my very beautiful mother and her friends at the beach. Often when I start a painting I just dive right in, but this time I sketched the scene in with graphite first, just as I had been trained. And I have been painting with real direction—I want to get this painting done and move on to the next one. I am fat with purpose. This entry was posted in Attitude and tagged lung cancer, tapping into creativity when struggling with a terminal illness, terminal illness and depression. Bookmark the permalink. all of that is awesome, Linnea. So happy you are feeling well enough to paint. It will do you good! Also so smart of you to enjoy each day. One day at a time is all anyone is promised. Life each one fully! Thanks Carolyn—Dad would be pleased that his paints are being put to good use. I’m so proud of you. Wishing you continued progress … physically and emotionally. My amazing friend, I’m so glad to hear you are feeling better, excited you are back on your painting-track again! Once again, your post was a lovely reminder for me and my life as well. Thank you! Love and strong hugs, this time from Stockholm! Anja, I realized how much time has passed when I saw photos of an obviously older Otto on facebook. I miss you all! Love and strong hugs zooming back to Sweden! Your painting g is fantastic – nearly as fantastic as hearing your mojo is back! Very inspiring of you to share so honestly what you face and how it affects you. I think your painting is ‘fat with purpose’ as well. Love that description! And I hope you’ll post your next painting, and the one after that, and the one after that, and …. I will, and I will post an update of this one when it is finished. I’m on what I hope is a sustained roll! So wonderful you are having this time and feeling well. You are a continued inspiration for all of us in many ways. Ms. Duff – I have admired your artistic talent since we first met at the Tavelli School. Thanks to recent change in family situation I am looking to add to my art collection. I would like to commission a painting. Are you available? Ms. Rand, I have admired your humor since we first met at the Tavelli School. And I am looking to dispense with my art collection—let’s talk. What a wonderful post to read tonight – so glad to see!! I continue to think of you & send positive vibes your way daily! Thanks DK37—me to you as well! So happy that your artistic soul has recovered as well as your physical body. Lovely painting. Please show us more of your work. Stand Strong, Lady D.
Thanks Hedy, I have been hard at work and will provide the evidence soon. I like your painting. It is always nice to get your update. We are going to Hong Kong tomorrow and will get in touch with you when I back to US. Take care. Joan, thank you and have a wonderful time in Hong Kong. I look forward to catching up when you are back home. For some reason your post this time made me think of the Byrds recording of Turn, turn, turn. This is the time for painting. A firend of mine who is an artist said that sometimes the painting just flows out of you and they are always the best ones. Enjoy Linnea. You must check out her work. She, too, works from old b/w photos of family in the 50s. Her compositions are sooo interesting. They’re all portraits, yet she intentionally leaves much of the figures out of the painting! The feeling of the images is always present – you just may not see the head, a face or much of a body. I think you’ll really enjoy her work. Linnea, I wish you continued hope, love, support, and a new desire to use your amazing talents. Jane, this comment languished in my box—so sorry and so good to hear from you (I will pm too). Very cool about your nephew; my kindred spirit! I miss my river walking days and glad he has continued to search for treasure. Tell him I found many bits of clay pipe, including one that was completely intact, long stem and all (how it survived, I will never know). I became a bit superstitious, and never felt I could quit searching until I found a bit of clay pipe, a marble and a button. My lucky three. And hey, I hope you are still making art! So glad to hear that you are able to experience some time in the creative flow. It’s the best place to be and any time that we get to spend there is a blessing. I hope that you get to linger there for a good while.